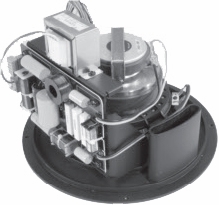 JBL Control 328C Ceiling Loudspeaker DJParts - All Variety of Parts that DJ Needs. Baffle: Metal, round, 305 mm (12.0 in) diamter, driver premounted to baffle, ported. Baffle Attachment to MTC-300BB8 Backbox: Attach via 4 #10 x .75 in (19 mm) sheet metal screws. Grille Attachment to Baffle: 4 pcs 4 mm machine screws. Dimensions (H x W x D): 305 mm (12.0 in) diameter round baffle x depth from back of baffle of 160 mm (6.3in) on 328C & 218 mm (8.6 in) on 328CT. Included Accessories: Ported baffle pre-attached, plus transformer on 328CT. Optional Accessories: MTC-RG6/8 Grille, round contoured, white. MTC-300BB8 Backbox, 25 liters (1 cubic feet) MTC-300T150 Transformer, 150 W for use with 328C. 1 In half space (in ceiling) 2 Average 1 kHz to 10 kHz 3 IEC standard, full bandwidth pink noise with 6 dB crest factor. 4 Measured in half space (in ceiling), ave 100 Hz – 10 kHz. 5 Measured in full space with 6 dB added for half-space calculation. Method used by some European manufacturers, for comparison purposes. 6 Calculated based on power rating and measured half-space sensitivity, exclusive of power compression. JBL continually engages in research related to product improvement. Changes introduced into existing products without notice are an expression of that philosophy.